As you know from my Learning to See post I’m currently working towards another professional designation. What you don’t know is that the credential being pursued is Lean Bronze Certification (LBC). One of the many Lean tool philosophies is Visual Management. Visual Management is about using visual indicators to affect people’s behaviour and the overall performance of a system or value stream. I recently adopted a visual tool to incentivize my personal goal to lose weight. To understand my weight loss predicament you should be aware that I live in the present. In a recent personality survey, the Maieutik test, I was roughly attributed to spend 25% of the time in the past, 50% in the now, and 25% looking forward. This seems intuitive to me – one of my personal credos is of sensible hedonism. Bringing us to the problem of why I’ve rarely been able to lose weight. The notion of weight loss and better health is sort of abstract and the immediate pleasure of a snack is far from. A friend and colleague of mine listens to many audio books, and one day during a coffee or cocktail, he was telling me of one of the case studies in the Influencer, where a set of research indicated that the number one thing you could do that would help you lose weight was weigh yourself daily. It sounded interesting, but inwardly I was skeptical. I could not make the connection as to why measuring yourself daily would make such a dramatic impact. I also knew that for me I would tend to forget the exact measurement anyway; I’d have a rough idea but not the exact numbers in my mind, thereby making exercise moot. Would I really have the will power to get out the scale every morning? Too many obstacles. Nevertheless, weight loss came up amongst my foundational vitality goals within my happiness project. Then at long last came a solution, the Withings Wi-Fi enabled scale! Using my love of gadgets to get me on the scale daily, leveraging the principles of visual management to keep me inline, and the promise in the Influencer actually worked! The desire to keep that line trending down the next morning, this real goal as opposed to some abstract good health goal made all the difference in my commitment to eat better. Eat better you ask? A different colleague of mine has cracked that code – cut out carbs after 2pm (assuming a 10pm bedtime). 4.2 pounds in a week? For me the proof was available if I could forgo the pudding. Previous to this experiment, I would not have thought I was a big snacker. I don’t stop at the store on the way home to buy chips… but if they are in the house… well, not anymore! My morning date with my Withings scale is, strangely, enough of an incentive to practice restraint, which is paying off for my vitality and my waistline. I’ll update my progress and the graph in a few weeks, to keep you up to date on progress towards my goal to lose 10 or more pounds. One month in and I’ve lost 7.1 pounds. My third week set me back a little bit, I was seduced by thin crust gluten free pizza after 2pm… twice… how bad could that be? Apparently bad enough. 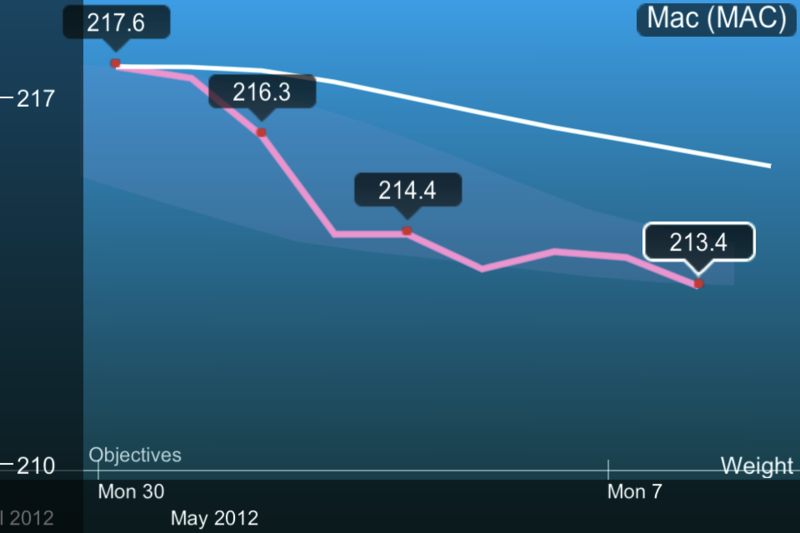 However all is now well, I’m back to my lowest weight and the trend line is once more pointed downward. Earlier this week I acknowledged that there was something lacking in my SMART News Year’s resolution model. By adopting the SMART technique it means that some of the overarching, higher level, bigger picture goals aren’t explicitly captured… these north stars are relegated to the land of the implied. pursue a healthy and nonjudgmental life.